Lucasfilm’s ILMxLAB showed off a new trailer for Star Wars: Vader Immortal at Star Wars Celebration, giving the first real look at the gameplay and story for the long-awaited VR experience that the company is working on together with Oculus. Officially titled Vader Immortal: A Star Wars VR Series — Episode I, the VR title will be the first of three episodes telling a new story written by David S. Goyer (centered around Darth Vader, of course). Players will take on the role of a smuggler pulled out of hyperspace near Mustafar, where they come in conflict with the Dark Lord of the Sith himself. And while the details of that conflict aren’t quite clear yet, it seems that players will be able to wield a lightsaber, and possibly even duel against Vader along the way. From a gameplay perspective, ILMxLAB is clear that this isn’t just a simple VR movie — it’s a fully interactive title, which the trailer showcases as players climb the side of the citadel and use tools. 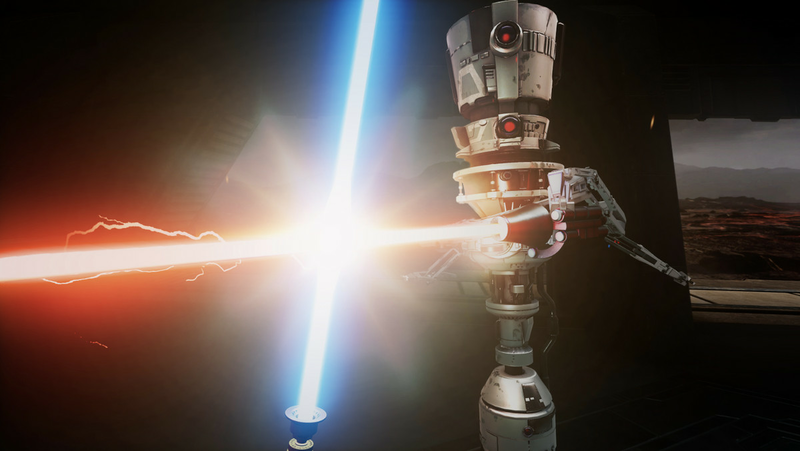 The main storyline of Vader Immortal — Episode I is said to take between 45 minutes to an hour to play through, but the title will also include a standalone “Lightsaber Dojo” mode for more open-ended gameplay. ILMxLAB also announced that Maya Rudolph will be joining the cast of Vader Immortal, playing the main character’s droid co-pilot named ZOE3, who’ll accompany you along the way. And voice actor Scott Lawrence — who has previously voiced Vader across numerous Star Wars video games — will be returning to reprise his role there, too. Chin Chin Gutierrez Isa Nang Ganap Na Madre!